UAVOS, located in the midst of surrounding Google properties in Mountain View, California, sells a wide variety of goods and services related to the unpiloted aircraft world. One of their biggest creations so far, the ApusDuo High Altitude Psuedo Satellite (HAPS) ran through a full series of tests. The 10-meter span prototype vehicle will test control algorithms, including takeoffs and landings and verify HAPS aerodynamics. 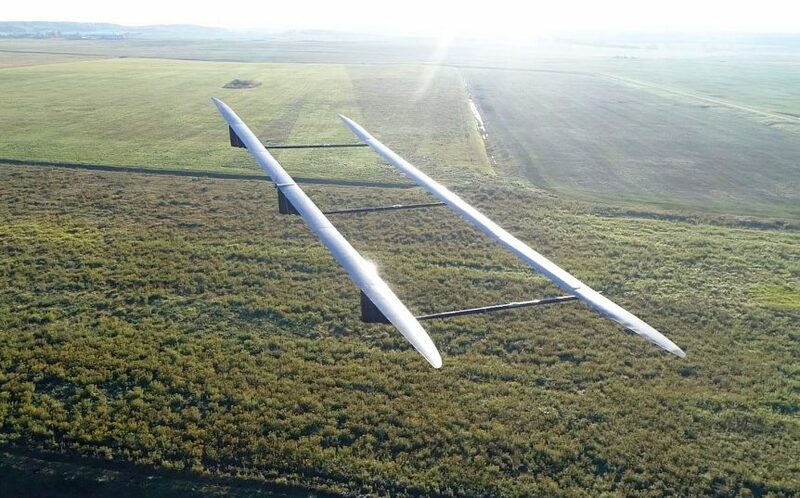 According to UAVOS “Test flights fully confirmed the flight characteristics of the UAV.” This is good news, since their next step will be to make at least a 15-meter wing (49.2 feet) wingspan version. That will rely even more on “Control of roll, pitch, v-shape and slip…due to a controlled change in the angle of attack in particular sections of the wings” employed by the designers. Note the flexibility of the entire airframe during launch and flight. These controls include the visibly tricky interactions of the two slender wings, a rare pair in tandem designed to allow their reactions to the air around them to maintain stability and structural reliability. Weighing a maximum of 23 kilograms (50.6 pounds), the ApusDuo stays within the FAA’s 55-pound limit for drones, but will occupy airspace between almost 40,000 and 65,000 feet. Plans seem to include a 28-meter (91.8 feet) version. The company makes a full array of automated control systems and control stations for aerial vehicles from under 15 kilograms (33 pounds) to over 1,500 kilograms (3,300 pounds). They produce UAVs from 15 kilogram fixed wing craft to their Pipistrel conversion, and a range of rotary-wing vehicles up to 107 kilograms (235.4 pounds) takeoff weight. UAVOS recently flew another of their creations, a Pipistrel Sinus (pronounced see-nus) under full autonomous control of their on-board systems. A Light Sport Aircraft such as the Sinus can carry a payload of 200 kilograms (441 pounds) for up to five hours, making it a useful tool for many applications. With a payload of only 40 kilograms (88 pounds), the Pipistrel can carry more fuel and stay airborne for up to 20 hours. The flight included a fully autonomous takeoff, navigation to a selected destination and back and a fully-autonomous landing. As UAVOS continues its flight tests on a growing number of vehicles, the company’s leading statement, “Beyond human capacity, under machine control,” will probably become even more apparent. Civilian and military uses for their aircraft and systems are well defined on their website.